A few weeks back, Pensive Thoughts was giving away free 2-week subscription to Fotolia + I was one of the first 10 lucky readers to leave my comment. Yay! I can really use some nice photos in my blog, plus I’d love to explore Fotolia. I am really enjoying browsing at the photos in this site + wasted no time in downloading several photos that I really love, including this image of lovely purple pansies I am entitled to 3 free picture downloads everyday + I make sure that I use my free credits every single time. I also used another Fotolia image in one of my posts here! I still have a few more days left, I hope I find more interesting photos to download. 1. One of my favorite birthday presents was + always will be my son, who came out 2 days after my birthday via a CS operation. 2. When you want out just say it + we have nothing more to talk about, it was as simple as that. 3. The moon is one of the most fascinating creations I have laid eyes on. 4. I guess happiness includes accepting + letting go of the past. 5. I was tempted by my inviting bed + my sleeping son to turn this off + just stay in bed. 6. Swim, have a henna, eat grilled seafood + learn to surf are some of the things I like to do on vacation. 7. And as for the weekend, tonight I’m looking forward to having a good night’s sleep, tomorrow my plans include going to my friend’s house with the little man and Sunday, I want to visit my Papa in time for Father’s Day! I heard about the much-awaited lunar eclipse yesterday when I turned the TV in the living room whilst Jared decided to have an early-evening exploration. I failed to hear the rest of the news though as I quickly turned off the tellie when the little man decided he’s seen enough of the living room + went on to explore the other parts of the house, with his mum at his heels. Needless to say, the anticipation about the impending astral display got lost in the thick of things, the chores that I needed to do, dinner + bathing Jared afterwards. I was sleepy by the time I was putting Jared to sleep + was snoozing even faster than my little man. It was a good thing I woke up around 2.30 am, + quickly woke my brother up, just in time for the usually bright moon’s transformation into a darker + red one. It was an amazing exhibition + I did try to capture it with my camera, although, after several failed attempts, I abandon the lost cause altogether, thinking I cannot capture it as close enough as I’d love to + as best as I should. 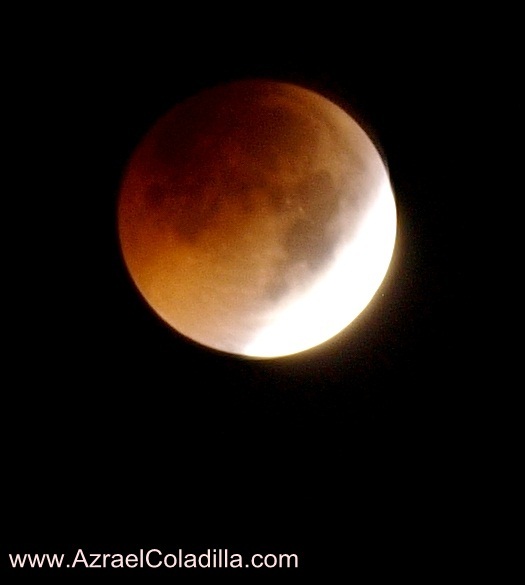 Good thing that other bloggers posted their own captured images of the red moon, one good example is that photo by pro-blogger, Sir Az. 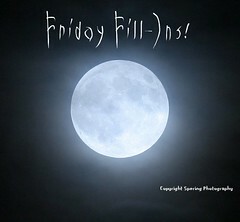 He’s got loads of moon images, capturing the moon, from one phase to the next, it is just amazing. Go see it if you haven’t already! As I have mentioned, this mum is a little hazy + groggy these days, no thanks to a self-inflicted sleep deprivation. I have been up in the wee hours of the morning tinkering on both this blog + my son’s corner. Am only glad that after a few days of less sleep, my blog is back to being decent enough for visitors to linger + leave a comment or two, again. I have yet to customize my headers, though, since the one I have now is the one that comes with this cool new theme I am using (many thanks to sis Gene, who has a brand spankin’ new travel blog, by the way, for her brilliant suggestion!). So I will be looking into tutorials on Photoshop + other image editing software where I can make my future lovely headers. Also, I think something’s gone haywire with the Search function + the search results are not showing up, so I also have to burn the midnight oil lamp + try to figure out what happened + how I can make it to function again. I’ll write some more posts now to work on my backlog + leave you all in peace! Happy Thursday one + all! PLDT myDSL’s Internet to Sawa TRANSFORMS my Internet experience from ho-hum to oohlala! Back in the days when I was just scouting for the best internet provider to get for my PC at home, in preparation to my being a stay-at-home mum + possibly a work-at-home one too, PLDT is the first company I checked out. I wanted to apply for their myDSL plan since I’ve been hearing rave review about it! So off I go to the local PLDT brach in our place, with Jared + Jared’s dad in tow, + a lot of anticipation, too. I was greeted by an amiable help desk but my heart sank several fathoms down when I found out that they cannot accommodate my application since the slots (or whatever they call them) intended for our humble barangay is surprisingly filled to the brim! You can only imagine my disappointment, I settled for the next best thing but until now, I keep thinking my PC, albeit old + rusty (at least figuratively, that is! would probably perform faster + better with PLDT myDSL in its arsenal! play my favorite Facebook game without a glitch! +, probably what’s more exciting, I can update my blogs more efficiently + with minimal stress! I can transform my otherwise slow PC into one-mean-online machine, heck, I’d probably transform myself into a one-mean-online worker if powered by 5 mbps! It would have been cool! Much like how cool it was to be transforming into a Nuffnanger from just being a plain Jane blogger! As a lucky Nuffnanger, I get to have all those colorful + lovely ads on my blogs. It means I get a chance to earn from them in the near future, too! + not only that, I also get to watch free movies + get invited to exciting + wonderful events (I am making separate posts about these experiences!) where I get to meet other Nuffnangers like me! What more can I ask for, really? Well, just a better internet connection, I guess! Sigh! I just wish there is another way I can get my hands with PLDT myDSL! For all you luckier creatures out there, visit www.myworldmydsl.com for more information or call 171 to confirm your subscription today!